IRCTC App is the official railways app that helps you to travel across India on any of the Indian trains. The app is available on both Android and Windows mobile based platforms and can be downloaded from Google Play Store or App Store. IRCTC Mobile Application is also available on Blackberry phones. The Android version of the App is called IRCTC Connect. It gives a satisfying experience of using the app as you can find everything you need, in just one place. The travel industry in India continues to grow and today every single India uses the Indian Railways at some point of time. With the new mobile trends, gone are the days when one through of standing in long serpentine queues and spending hours to book a ticket. 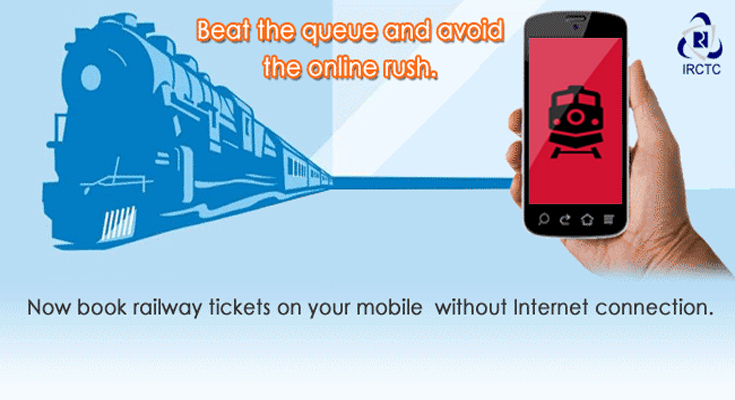 IRCTC has made the ticketing process simple by launching its IRCTC mobile App. There are several other Indian Railways related apps, in the market today. The IRCTC App has some of the basic features like listing of trains between two destination stations, checking for PNR Status, booking and cancellation of tickets, checking for train schedules and more. In addition it generates some useful alarms for your train timings, like if the train is running slow or is expected to reach early. It checks the PNR status and notifies the user on confirmation or on change of PNR status. The app allows users to make online payments viae-wallet mobile payment system. The e-wallet initially needs to be topped up at ticket counters or via the IRCTC website via a credit/debit card, before its use. The app also allows you to check timetables on your smartphone. The App takes every necessary step to provide its passengers a comfortable journey. It not only provides booking facilities but also provides other services; relate to one’s travel needs. The best part is that the passengers do not need to carry a printout of the ticket during his travel. Users have only to carry a valid identity proof; during their journey provided they have the soft copy of the ticket. This SMS ticketing has become very popular among the youth and today even the senior citizens have stated using the facility. This paperless ticketing facility has helped Indian Railways to go green. One can check out routes of multiple trains on this app and choose the best option. The app provided real time status of all running trains.The GPS based software tracks the movement of trains and the information is useful both to the railway officials and to the individuals. Though there are several issues with the App like slow speed, server errors and website hanging during heavy traffic but yet the advantages are more. According to statistics, more than 24 million passengers use the Indian Railways every day. Though there is scope of improvement in areas like webserver configurations, website architecture, the problem is not limited to software or hardware but to meet India’s huge demand and supply which is a challenge in itself. The IRCTC App has helped to reduce passenger frustration significantly, and hence more and more people have stated using it.Indian Railways on an average day sells around 21 million tickets and the launch of the IRCTC mobile app, has eased the process. The IRCTC App is undoubtedly one of the best and most comprehensive Apps developed by Indian Railways!